CH Joywood’s Thrill of the Chase CD RN ME is known around the house as Haggis. Most cairns are fairly happy-go-lucky but you could use this guy’s tail as a fan. As a puppy he wagged his tail in his sleep. He’s the best little pal a person could have. In addition to being an AKC champion Haggis is a natural at earthwork (a fearsome worker, he). 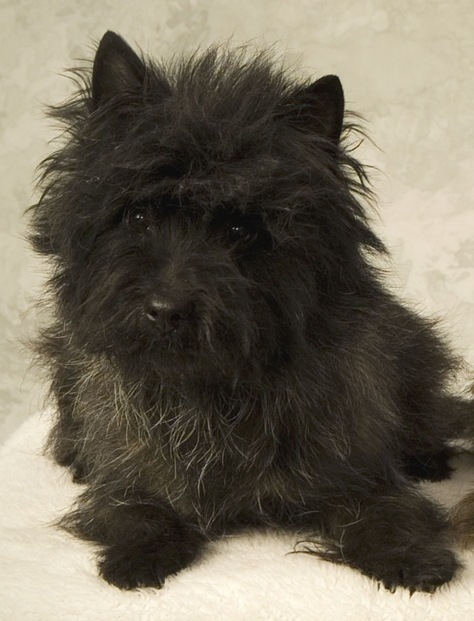 With a racing style reminiscent of NASCAR Haggis was a one-time Fastest Cairn Terrier in the Northwest. He’s a Dad and a Grandfather. Of course the other haggis has fans, too. At the age of 12, Haggis gave Rally Obedience a try and earned his “nurse” title (RN). On July 19, 2012 at the age of 16 years, 11 months and 12 days, Haggis left our home to dwell forevermore in our heart. Rest in peace our dear friend and companion. Thank you for all that love you gave us, and all the adventures you led us to. I loved seeing Haggis at Belden Farm as I was passing through. Turned out it was just as well I left the freeway when I did due to a terrible head on accident. I looked up Haggis’ pedigree online and my boy Leo also has AMCH Persimon of Wolfpit in his line, only on his Sire’s side instead. I imagine lots of cairns are related, but something in his eyes made me look it up. I was going to help out my dad who was having surgery so I needed the destressing effect of petting the old boy. Thanks very much. Thank you for the kind words for the Haggis. Sorry I was out in the field when you came by. Haggis has many tail wags and soulful gazes to offer, so you are welcome to visit any time. Isn’t it interesting how we can see relatives so easily? Peggy and I were in Minnesota once and a dog caught our eye that reminded us so much of our boy. We looked at a catalog and lo, he turned out to be a half-brother!